Started a new section! The column, The Shanghai study-abroad Journal, will tell you the local lifestyle and apple affairs. The New Year has started, but the excitement of the holiday seems to be reserved since they celebrate Lunar New Year more splendidly. Christmas holidays and New Year’s Day are celebrated at the same time. 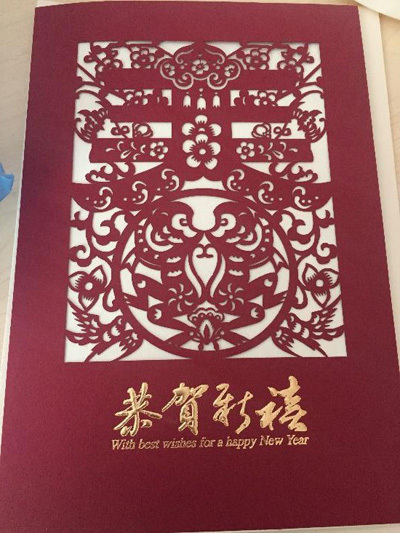 I realized it’s the year of Monkey; the zodiac signs only matter to me when I write New Year’s cards. Originated in China, the twelve zodiac signs end with the Boar in Japan. The character means “pig” here. Depending on the country, the twelve animals sometimes appear to have different connotations, such as a cow to a buffalo or a rabbit to a cat. Speaking of cats, I often find stray cats and dogs. Some sit still at roadsides and/or in stores, others cross right before my eyes or come out from behind the register. I sometimes end up screaming and I’m afraid that I might step on one someday. ▲Acting as if she owns the place. 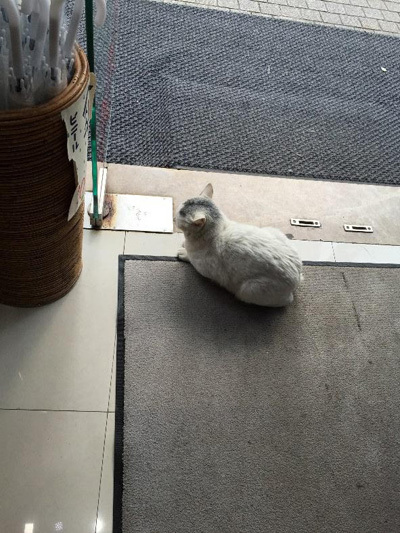 Blocking the entrance of the shop, she doesn’t move even when the clerk yells at her. Let me look back on Christmas. The culture of this day is spreading among the youth. In Japan, we start to get ready for New Year’s Day right after Christmas. In China Christmas trees will stay for another month, and in my dorm as well. I’ve enjoyed looking at them in an unseasonal way. At Christmas there is a curious custom to send or eat apples, wishing peace. The shops display the gift-boxed apples in piles. Some look more attractive than a bunch of roses. I learned that apples can be reborn depending on the presentation. ▲A paper-cut message card I received from my friend. Do you recognize the monkey in the center? Recently I happened to find some apples with Christmas patterns being sold in a fruit shop. 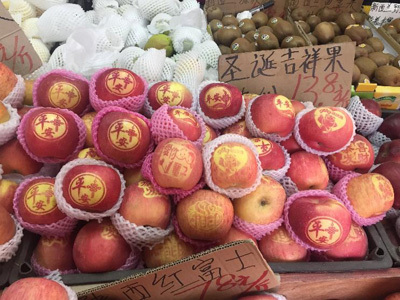 They were home-grown Fuji apples priced 13.8 yuan/500 g, which is only 17 yuan for two. 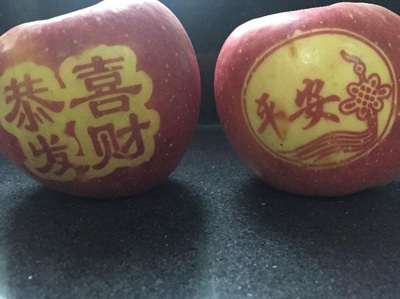 Although the coloring of the apples was sparse, I thought of saving them as decoration. But I decided to eat them before the taste spoiled. They were very crisp and delicious enough. All of the above are produced in Aomori. It was relatively inexpensive with a producer’s sticker and a perfect look. It tasted good, with enough sweetness, but I wish it had been a little crisper. I wonder if it was sitting there for days or being kept in the wrong storage. I felt disappointed, largely because of my extra expectation. After all, Aomori apples are superbly delicious. I understand that the price naturally goes up after adding on the distribution cost and so on. ▲Two apples I bought. Both slanted a little. Left: The four-letter word means that you wish to make money and it’s used as a greeting at New Year holidays. countries; it recorded as low as -7.2degrees C after 36 years in central Shanghai. We have some severe cold days, but not much snow here. It’s a lot easier for me to live here coming from a heavy snowfall area like Hirosaki. Toward the Lunar New Year holiday starting from February 8, the number of homecoming people with huge baggage gradually increases in this city. I’m excited to celebrate the big event as well. Currently a junior student at university. She belonged to the tennis club in junior high school and the Japanese Archery club in high school. She decided to study abroad in one of the developing nations, including China, to learn about business including trading and sales. She was selected as one of the members of the joint public and private effort project, “TOBITATE (Leap for Tomorrow) Study Abroad Initiative” and is currently located in Shanghai. The first half of the term is spent learning the Chinese language and an internship at a Japanese-affiliated company will be added in the latter half.